I have a secret: a few days ago, my lunch pretty much consisted of a stop at a hip ice cream shop to enjoy a cone with a scoop of my favorite flavor: “Secret Breakfast,” which mixes bourbon-flavored caramel and corn flakes in a sweet cream base. First of all, yum. But it also reminded me how important creativity and surprise can be as marketing tools. Every scoop shop offers bread-and-butter flavors like chocolate and vanilla, but it’s the other buzz-worthy varieties that define their brands. (And I say this as an avowed vanilla-lover.) But what triggered email secrets can I learn from ice cream? Think about workhorse triggered emails. Welcome messages, transaction receipts, and shipping notifications probably come to mind. They’re functionally important, and they form the foundation of any successful email program. That’s why every email marketer needs to understand the basics of triggered emails. If you’re in the retail industry, you’ve probably become familiar with how to use triggered email in retail. But what about some unexpected flavors? Today, I’m going to let you in on seven triggered email secrets that you can use to mix up your vanilla programs and drive increased engagement. Here’s one of my triggered email secrets: there aren’t many people who love onboarding emails more than I do. In its most basic form, onboarding begins with a staple of triggered email—a simple welcome message. However, onboarding also encompasses many additional opportunities to engage with recipients with triggered emails. Here’s one example of an effective form of onboarding. The message breaks the process into easy-to-digest steps and encourages the recipient to take the first step towards engagement. Why it works: This email makes it seem easy to achieve the desired action by emphasizing that it takes just 10 minutes. Guess what? The second triggered email secret I’d like to share is another onboarding message! In this follow-up to an initial welcome message, the recipient is asked to define her or his messaging preferences and some other key demographic information. The benefit to the merchant is clear: not only has a new customer taken a further step to engage with the site, but also has shared explicit data that serves as a foundation for future successful email marketing. 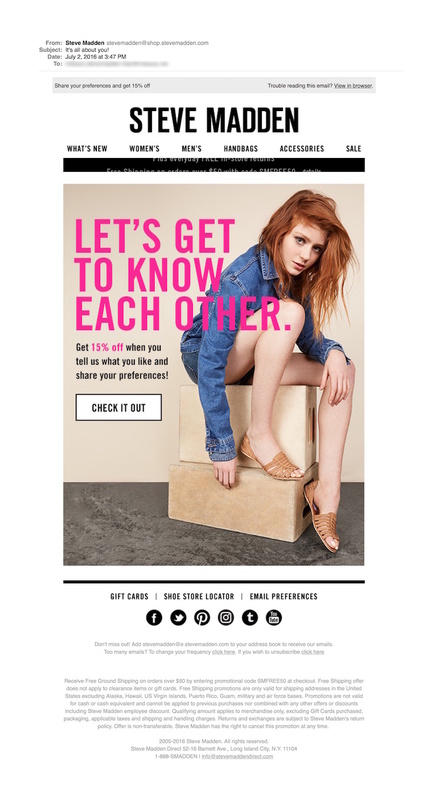 Why it works: To sweeten the deal, Steve Madden offers a discount and call-to-action that feels like a win-win. Along with a welcome email, a thank you is a cornerstone of any triggered email program. It’s good manners—and represents a step towards building a personalized relationship with a customer. But the secret of this triggered email from Art of Play is that they noted I recently made a second purchase. Why it works: As a customer, I feel really appreciated. The marketer in me understands that Art of Play is using good segmentation to note that I’ve suddenly become a high-value customer to them. Like thank you notes, shipment notifications are a workhorse of any triggered email program. But look at this follow-up to a first shipment notification from Amazon. The email is actually an optimally-timed onboarding message. Rather than overwhelming me with site features related to order tracking when I first sign up, it’s instead sent just when I first need it. 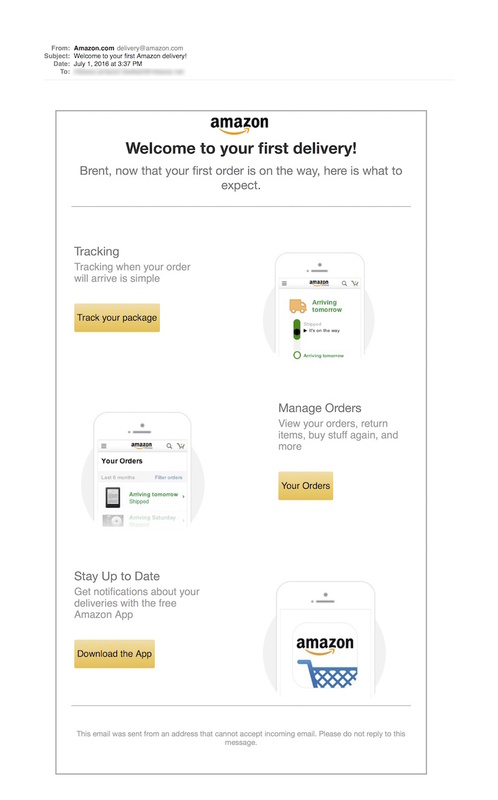 That’s smart, and one of the triggered email secrets of Amazon’s success. Why it works: Shipment and order tracking tools are introduced to a new user at precisely the time she or he would find that information helpful. There’s no question that customer reviews are an important part of today’s retail marketer toolkit. However, not every merchant takes the time to explicitly ask for that feedback. Even fewer senders ask for feedback at just the right time, when a customer is most motivated and still noticing first impressions of the product. Consequently, an email triggered by order shipment (or better yet, delivery confirmation) is the secret to success with messages like this. Why it works: Timing is everything. Banana Republic’s note arrived in my inbox the day after I opened the package. Anniversaries, birthdays, and other key dates are opportunities to send messages to customers in a way that feels delightful, rather than like just one more marketing pitch. They’re also good building blocks for adding emotional qualities to the relationship you have with each recipient. 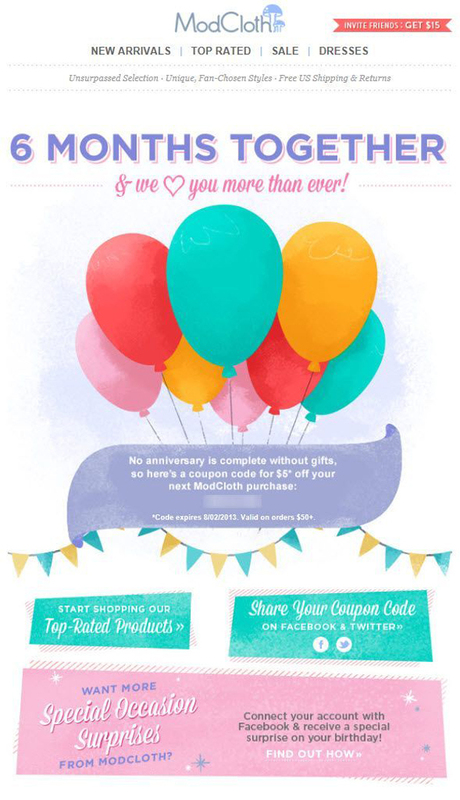 This note celebrates the anniversary of a customer’s first transaction with ModCloth, and the promotional discount and social sharing features work well to drive additional transactions and brand reengagement. Why it works: Like a thank-you note, this celebratory message helps the customer feel appreciated, while the promotional discount and brand reengagement also happen to be great for business. One of the best practices for any email marketer is making sure that recipients genuinely want to receive messages from you. That means a lot more than the minimum of opt-in (or even double opt-in). “List hygiene”—the regular culling of inactive and other problematic addresses—is a key part of ensuring high performing, highly-deliverable email that sends all the right signals to ISPs about user engagement. It’s also part of a winning engagement strategy that conveys to your customers that you treat them with respect. That’s why this message from Return Path is so successful. It serves an important functional goal, is highly engaging, and it’s a winning example of the sort of secret triggered email that more marketers should use. Why it works: This message walks the walk of email best practices—and makes a “dull” list hygiene task anything but boring. These seven emails break out of the box. 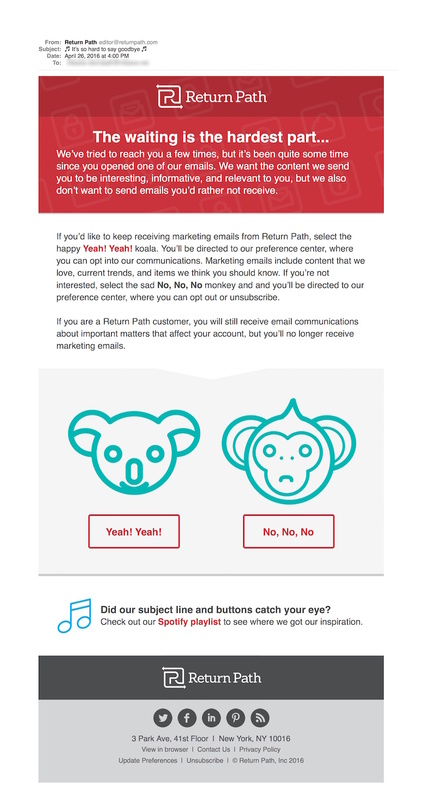 All are great examples of triggered email secrets for driving customer engagement. They overachieve on key metrics such as open rate, because the sender tailors them to the recipient’s needs and context. These examples also demonstrate a commitment to building an individualized relationship with the recipient. What are some of your triggered email secrets? I want to hear your tips and tricks and what kinds of email are your own secret top performers.